The M4V file format or file extension is a video container format developed by Apple and is almost identical to the MP4 format, except that M4V files may be protected by Apple’s FairPlay DRM copy protection. In fact, unprotected .m4v file can be renamed to .mp4 file and played in most popular media player. Thus, if you’re ripping DVD to a video file by using HandBrake, the popular open source video transcoder, there is really no reason to save the video file generated with .m4v file extension, as .mp4 file extension will do just fine and has broader support among media player and media server such as Plex and Kodi. HandBrake loves to save output video file with .m4v extension especially when automatic file naming is in place and there is queue to encode videos. 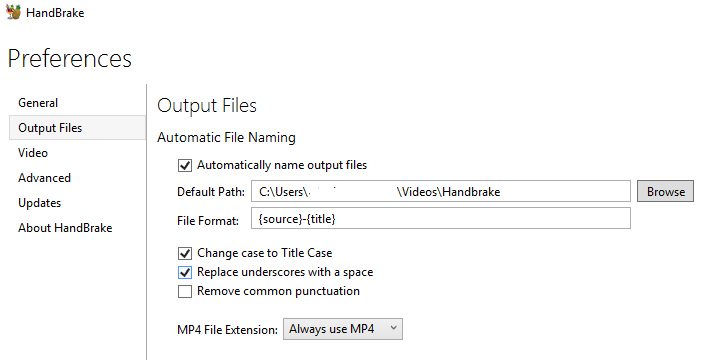 To avoid keep changing the name of output file manually for each and every videos or titles of DVDs, it’s possible to force HandBrake to always use .mp4 instead of .m4v file extension. In HandBrake, go to Tools -> Preferences. In the drop down menu for MP4 File Extension, select Always use MP4. The setting is auto-saved. Click on < Back button to go back to main screen. Reload the source and you will have the output file extension automatically set to .mp4.